Fima Chupakhin was born in Kryvyi Rih, Ukraine. He was first exposed to music in the age of 5, when his mother had bought him a children’s piano. Since that time Fima fell in love with music and the sound of piano. He was exposed to a classical piano repertoire, choral, jazz and Ukrainian folk music when he had entered a music school, and that had significantly influenced his future musical outlook. In 2007 Chupakhin formed the “Acoustic Quartet,” with whom he recorded 3 albums of mostly original music. In 2010 “Acoustic Quartet” won a Gran-Prix at the prestigious Jazz Competition for the Young Performers at Usadba Jazz Festival. Since that time “AQ” (acronym for Acoustic Quartet) had become one of the most famous Ukrainian jazz groups in the Post Soviet Union area, and Chupakhin – one of the top-ranked young Ukrainian jazz pianists. In addition, Fima gained the reputation of being a prolific cross-genre keyboardist, as he had participated in recording of 15 non-jazz albums. Just a year ago Fima’s band “AQ” released a collaborative folk-jazz album “Krosna” with an acclaimed singer Anya Tchaikovskaya. The album was ranked number 8 position in top-10 Ukrainian albums of 2015. Recently, Chupakhin and AQ produced a special jazz set for a winner of the Eurovision Contest, Ukrainian pop-star Jamala. The project was presented on the Constitution Day of Ukraine at Alfa Jazz Fest 2016 in Lviv. Moreover, Chupakhin is a prolific film and multimedia composer. One of the works he scored includes a full-length documentary “Mustafa” about the national leader of Crimean Tatar people, Mustafa Djemilev. The documentary was presented on Oct 28th 2016 at Kyiv “Molodist” film festival. 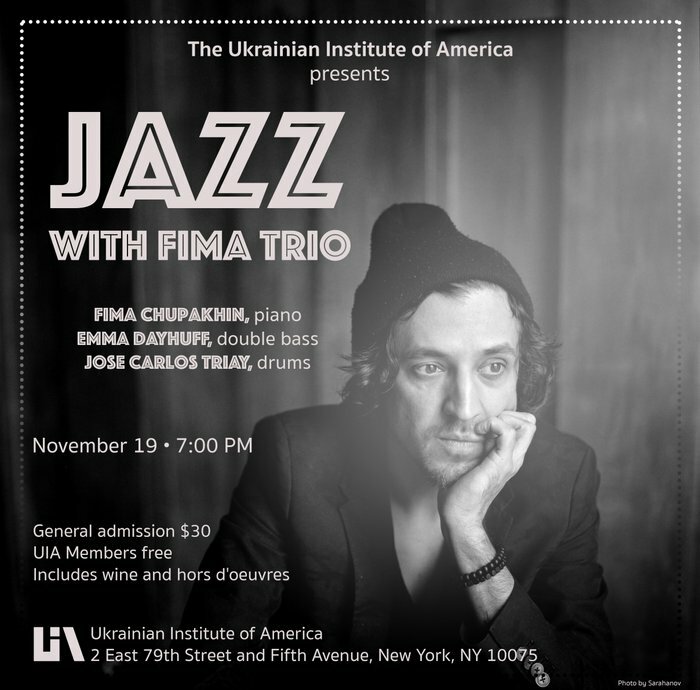 In 2012 Fima has been awarded the world’s prestigious Fulbright Scholarship to pursue his master’s degree in Jazz Studies at William Paterson University of New Jersey. At William Paterson Fima shaped his unique voice under the leadership of the highly praised pianist James Weidman, and other great musicians, including Armen Donelian, Steve LaSpina, Vincent Herring, Rich Perry and the legendary piano player Mulgrew Miller. Chupakhin also holds a master’s degrees in Jazz and Classical Music from Kharkiv State University of Arts (Ukraine). Currently Fima lives and works in New York City.